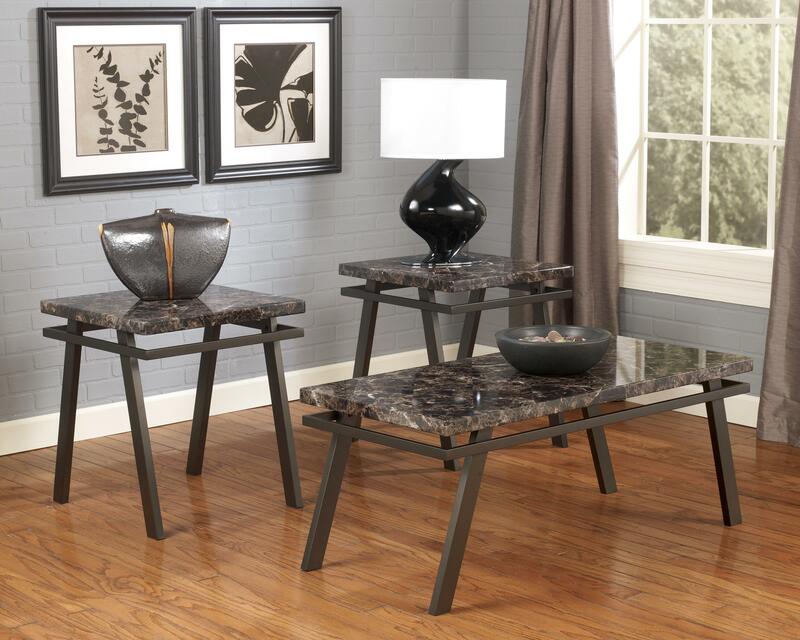 Faux marble table tops supported by contemporary metal bases give this three-piece occasional table set a refreshing look for your decor. The angled metal bases of the rectangular cocktail table and two end tables are each finished in a bronze color powder coat finish. Take inspiration from the new look this table set will provide your living space. The Paintsville Occasional Table Set with Metal Bases & Faux Marble Tops by Signature Design by Ashley at Michael's Furniture Warehouse in the San Fernando & Los Angeles area. Product availability may vary. Contact us for the most current availability on this product. Description: Top Thick look top made with print block pattern marble paper. Top is finished with full sheen polyurethane. Case Construction Table base made with tubular metal in a bronze color powder coat finish.